Our range of Washable Incontinence Pants look and feel like normal underwear and are an economical alternative to disposable products. Suitable for light incontinence, some of the washable pants come with a built in pad. Alternatively, you can use an insert pad with pouch pants to provide more protection. 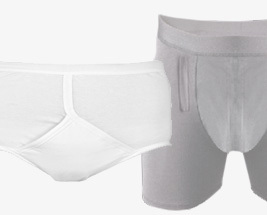 If you require a product suitable for heavier levels of incontinence then please review our range of Men's Disposable Pants.